Attention, new freshmen and transfer students: This fall's New Student Orientation will take place Aug. 23-25, 2019. The NSO program welcomes you to campus the weekend before fall classes begin! On behalf of the student orientation leaders, orientation assistants and Niagara administration who make up the New Student Orientation (NSO) team, WELCOME to campus as the newest members of the Niagara University student body! This website is the new student hub for important information about this fall's New Student Orientation! The New Student Orientation program is for ALL new students, including residents and commuters and is a requirement for everyone! What better way to begin your Niagara careers than beginning all together as one! NSO is a great follow-up for our incoming freshmen from your summer orientation experience and a all-encompassing welcome experience for new transfer students. The goal of NSO is to provide you the opportunity to experience what it means to be a NU student. Through NSO, you will develop a deeper understanding of Niagara’s core values, become acquainted with your surroundings and meet your classmates and other members of the Niagara University community. All of this is designed to help you gain some Purple Pride! NSO begins on Friday, Aug. 23, with new student residence hall move-in and commuter check-in and lunch in the Gallagher Center. NSO continues for all new commuters and resident students right through Sunday, Aug. 25. Throughout the weekend there will be sessions on academic policy and student affairs resources, as well many fun events and campus traditions to participate in. NSO concludes with a welcome celebration for both new and returning students! Classes then begin Monday, Aug. 26. In anticipation of your arrival to campus, you are encouraged to “Like” Niagara University on Facebook. Do you tweet? Niagara University sure does! Follow these pages to have all the latest information about all that is NU! 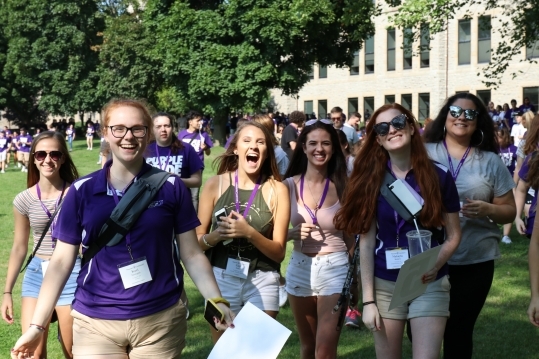 New Student Orientation is designed to get you off to a good start in your life inside and outside of the classroom here at Niagara! Please contact the Office of Campus Activities with any questions you may have at NUorientation@niagara.edu or by calling 716.286.8510.